The symphonic band Red Rose from Israel comes with fresh ideas of how to give new life to metal. A small album of 8 songs has just been released via Scarlet Records, but mostly it is mainstream hard rock that Red Rose makes. Metal pop and fairytale rock is a good thing, but in the Red Rose eyes it becomes a little too tame to make a real difference. They are trying hard, but only two songs can stand out to be counted on from the album On The Cusp Of Change. So it is not that many changes we are served for our hungry ears. 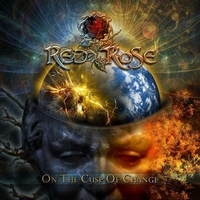 Chasing Freedom has potential, symphonic heavy metal in a hard and well composed pot is one shot at glory from Red Rose. The other song that could make some momentum is Alone In The Night, a soft melodic ballad with lots of quality and worth a good listening. But two songs of interest is not enough when the album only has 8 songs in total. Better luck next time.